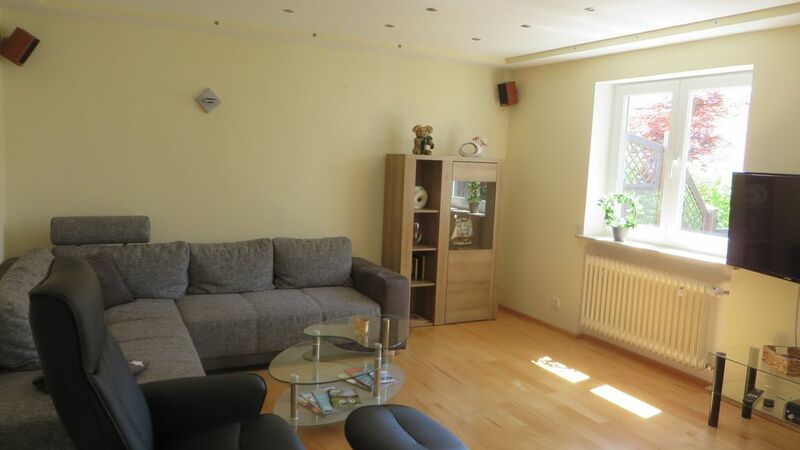 This beautiful bright and modern apartment can accommodate up to 4 people. From the south terrace, the conservatory and the small garden you have a beautiful view of the (local mountain) Pfänder. The large open plan living dining area offers plenty of space to relax and enjoy. The kitchen is fully equipped and offers everything a hobby chef needs. Our lovingly furnished apartment is located in a dead end. The apartment has a separate entrance and is located in the basement of our house. Since we ourselves have 3 children, we are also happy about families. Parking is free in front of the house or on the street. Storage for 2 bikes can be used gladly. Of course we provide towels and bed linen. The bedroom with large closet and double bed (1.80 x 2.00) invites you to dream. The sofa bed offers extended (1.40 x 2.20) space for 2 more people. Baby cot and high chair can be provided free of charge. The bathroom has a large shower and a bath. A bicycle rental is located in our street. Bus stop, bakery and ice cream parlor are within 5 minutes walking distance, restaurants and shopping center in 10 minutes. The lake is 1.6 km and the island 2.4 km. The tourist tax is to be paid on the spot (2 Euro per day and person / 1.30 Euro for children from 6-16 years). In the period from April to 31. October you can drive with the Lindauer guest card free of charge with the buses of Stadtwerke Lindau.